Nestled between Austria, Hungary, Ukraine and the Czech Republic, Slovakia is truly at the heart of Central Europe, however the country often gets overlooked in favor of its larger, better known neighbors. With its affordable ski slopes, awe-inspiring peaks and natural parks, and the highest number of chalets and castles in the world, the country has established itself as a blossoming tourist destination. 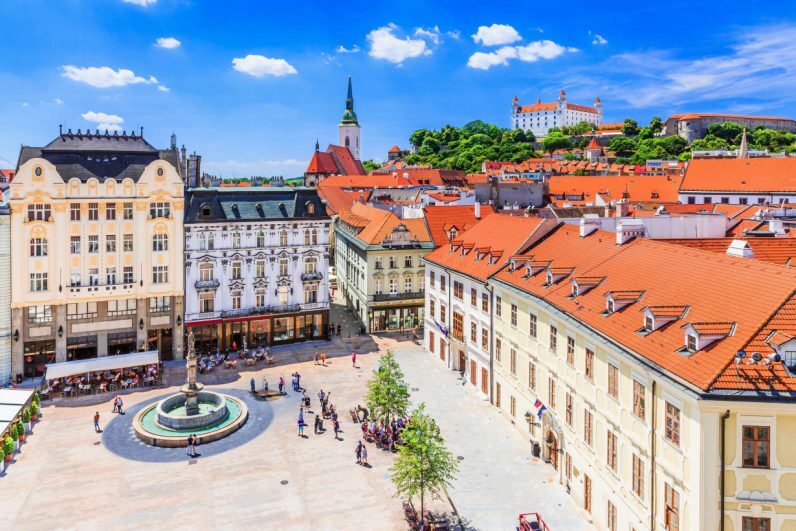 However, while its capital Bratislava is increasingly drawing hordes of holiday-makers from both the east and west, there is a lot more going on there than meets the eye. While operating on a much smaller scale than more established tech hubs like Berlin, London or even Budapest, Bratislava is starting to mark its territory as a ripe tech talent base, and an attractive, affordable startup location. Last year Inc. Magazine reported that 57% of the country’s economic output was the result of small and medium sized enterprises (SMEs), and that the country ranked disproportionately high on the Inc 5000 Europe list of Europe’s fastest growing private companies, with 107 homegrown enterprises featured. This is especially impressive when compared with hubs like London, which has 16 times the population of Bratislava, but only has 177 enterprises on the list. And while the capital’s population – 500,000 people – pales in comparison to other European cities, it has allowed for the growth of a tight-knit community of local entrepreneurs who work together to bolster the reputation of The Danube Valley. Local businesses assist one another in getting a ´foot up,´ to scale, and to compete on the international market. I recently had the opportunity to enjoy a visit to the Slovak capital while visiting Europe. Here are some key takeaways for entrepreneurs who are considering starting up in Bratislava. Since gaining its independence from Czechoslovakia in 1993, entrepreneurship in Slovakia has gradually come into its own. In the last two and a half decades, the nascent tech scene has drawn strength chiefly from its advantageous location and an abundance of tech talent. With borders touching 4 central European countries plus Ukraine, the country is within an hour’s drive to three major European cities: Budapest (Hungary), Vienna (Austria), and Brno (Czech Republic). The young, active tech scene doesn’t take this for granted, and while the official language is Slovak you’ll find businesses frequently conducting affairs with international clientele in English. The importance of available homegrown talent can also not be understated. Local engineering schools Technical School of Kosice and Slovak University of Technology in Bratislava – with more than 15,000 students and 147,000 graduates – provide a huge boost to young startups. Across Bratislava a number of impressive, modern co-working spaces have been started to equip entrepreneurs with the resources they need. Campus Cowork, located in Staré Grunty, has welcomed startups from 14 different countries to work in its offices since its launch in 2016. The expansive coworking environment has over 70 startups now using its facilities and students are also allowed to access the space in order to work alongside leading entrepreneurs. The benefits of working here stretch from access to community events to legal advice and even an in-house bar – all geared towards encouraging partnerships and collaborations among the ecosystem. Two other coworking pacs that draw considerable attention are Impact HUB and HUB Bratislava. Since opening in 2014, Impact HUB has offered a coworking space and support network for startups, investor projects and ventures, all of whom frequently find themselves working just across the desk from future partners. Through a number of hackathons, accelerators and workshops, the coworking space fosters broader social growth for the Slovak tech community. HUB Bratislava, launched by Michal Rusek, offers virtual offices as well as in-house space. The budding Bratislava tech scene benefits from a number of public and private initiatives, not to mention a President – Andrej Kiska – who is committed to helping grow the tech scene. One such programme, the Butterfly Effect – supported by Hubhub, Sygic and PixelFederation – offers a full-time courses geared towards young developers and innovation leaders. Throughout the coursework, interdisciplinary teams work under the supervision of experienced professionals, applying their newly acquired tech knowledge to practical real-world projects. In a bid to retain homegrown talent, the NGO LEAF offers paid internships to young Slovaks committed to staying in Slovakia, providing the next generaion of future shapers guidance and job security. Slovakia’s second annual Innovation Day is also coming up at the end of September. Backed by the German-Slovak Chamber of Industry and Commerce (GSCIC), the day aims to bring together international players and connects them with Slovakian startups. The event is brimming with success stories as well as ample networking opportunities for forging effective partnerships. Finally, the public-private initiative SAPIE, the Slovak Alliance for Internet Economy, aims to bolster the Slovak entrepreneurial ecosystem by nurturing technical and creative talent. Its 60-person members include Google, Facebook, Eset and Neulogy. Tech success stories are growing in number, stimulated by annual tech events. The biggest of these events is the FutureNow Conference. Hosted in Bratislava, FutureNow has helped fuel Central Europe’s startup scene for eight years going. It recently held a startup competition that took place as part of Slovakia’s largest music festival, Pohoda. Before a backdrop of world class musical acts, judges evaluated a number of startups and crowned Bratislava startup Secret City Trails the victor. FutureNow will hold its next event on October 24 in Bratislava’s Refinery Gallery. Among the most prominent startups to emerge from Slovakia are Sli.do and Decent. Sli.do already has a global following and encourages participation in presentations by offering an audience tool, saving viewers the fear of having to ask their own questions in a public setting. Sli.do was used in last year’s Web Summit. Decent, now based in Switzerland but founded by Slovak entrepreneurs in 2015, created an open-source blockchain platform to help enterprises build decentralized applications. There is also Bratislava’s Aeromobil and travel app Sygic. The futuristic Aeromobil, one of central and eastern Europe’s most exciting tech prospects, is designing hybrid car-airplane prototypes, capturing not only the imagination but also a recent funding opportunity. The navigation app Sygic is currently used by over 200 million people worldwide, connecting smartphones to vehicles. Currently led by Martin Stigac, Sygic now includes a smart mobility platform that addresses congestion and optimizes travel routes. There is also 0100 Ventures, which is a venture builder that runs a series of conferences and consulting ventures. What these and the majority of other Bratislava tech businesses have in common is their outward-focussed, international-oriented mindset. This mentality underlies most Bratislava ventures, meaning that the groundwork for expansion is ingrained in the company from day one. For a look at the multitude of other startups shaping Bratislava’s tech transformation, a more extensive list can be found here. Another popular media resource for startups in Slovakia is SlovakStartup.com, which was founded by Dusan Duffek, Peter Dendis and Michal Tomek. Though investment opportunities in Slovakia have not always been abundant, venture capital investment in Slovak startups has grown over the last few years, boosted by the creation of funds like Neulogy Ventures, Braun Holding, and Limerock. Also topping the list of local investors is CEED Tech – a consortium of five Central and Eastern Europe startup accelerators – and LAUNCHER, a startup studio primarily offering seed and early stage investments. Angel investors include 42angels, a group of Czech and Slovak entrepreneurs offering angel and seed stage investment, as well as Speed Invest and Credo Ventures. This year economic growth has been spurred by a 6.2% surge in investment in the first quarter of 2018. Investment, then, like Bratislava’s broader tech ecosystem, is on the up and up. In the last 25 years the capital’s entrepreneurial ecosystem has grown up, strengthened by its favorable location, talent pool, local support, and growing access to capital. Though the majority of those arriving in Bratislava are still drawn by its old world charm, the growing excitement of the city’s new-age innovation will undoubtedly attract more and more in the years to come.